Not to be confused with Okawa. Owaka is a small town in the Clutha District of South Otago, in the South Island of New Zealand. It is the largest community in the rugged, forested Catlins area, close to the border with Southland, some 35 km (22 mi) south of Balclutha on the Southern Scenic Route. The town's population was 334 in the 2006 census, a decrease of 39 from 2001. In the census figures, 72.9% of the population were European, and 15% were Māori. The town's name comes from the Māori for "the place of canoes", a reference to the town's location close to the Owaka River, which joins the Catlins River three kilometres (2 miles) from the town, close to the coast. 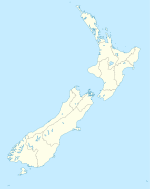 The town was originally called Catlins River, then Quakerfield. On 22 June 1896, Owaka became the terminus of the Catlins River Branch railway, and it retained this status until an extension of the branch line to Ratanui was opened on 1 August 1904. The railway ultimately terminated in Tahakopa, but as traffic declined on the line in its later years, the Tuesday freight train (one of four per week) ran only as far as Owaka after 1958. The branch closed on 27 February 1971, and little evidence of its existence remains in or around Owaka besides some of the line's old formation, as the last substantial relic, Owaka station's goods shed, was removed in 1986. The smaller settlement and holiday location of Pounawea is 4 kilometres away on the estuary of the Catlins and Owaka rivers. ^ A W Reed (2002). The Reed Dictionary of New Zealand Place Names. p. 375. ISBN 0-7900-0761-4.